Chapel at Grace Christian School is one of the highlights of my week. 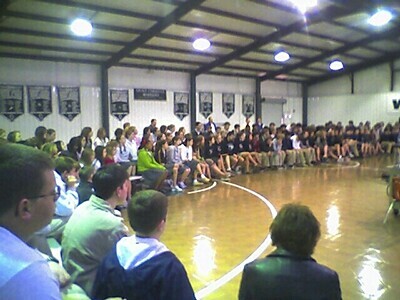 I lead the elementary school chapel every Wednesday and the JH/HS chapel every Thursday. The elementary school students are more responsive and really get into it. The JH/HS students are more reserved but we're developing a good rapport. Children and youth are amazing ... so much energy and creativity! I've always enjoyed working with them but they will definitely keep you on your toes. If all you've got are stock answers and platitudes you won't last. They're hungry for real answers to real issues. Maybe that's it ... their quest for a true reality helps keep me real. Thank you guys!